- Zikke wants you to be thrilled with your new purchase. However, if you need to return an item, we're here to help. You have 30 calendar days to return an item from the date you received it. 100% MONEY-BACK GUARANTEED. Pets need regular hair grooming to keep clean, healthy and radiant. Our clippers offers pets professional hair grooming at home. Zikke pet grooming clipper kit provides superior safety and comfort, top quality and reasonable price for all pet lovers. Please clean and brush pets hair before trimming, it will make the grooming process much easier. We also recommend using stainless-steel combs and scissors to cut long, thick hair (such as Samoyed, Afghan Hound, Maltese, Border Collie, German Shepherds, Havana, Himalayan, or Yorkie) before trimming process to keep from pulling hair. PROFESSIONAL PET CLIPPERS WITH 2-SPEED - Professional pet clippers are designed for DIY cutting at home and all fairy pets such as dog cat & other Animals. Operates with no skills. 2-Speed control for different needs; 5500/6500 rotation per minute. Super quiet and cordless design for easy use. 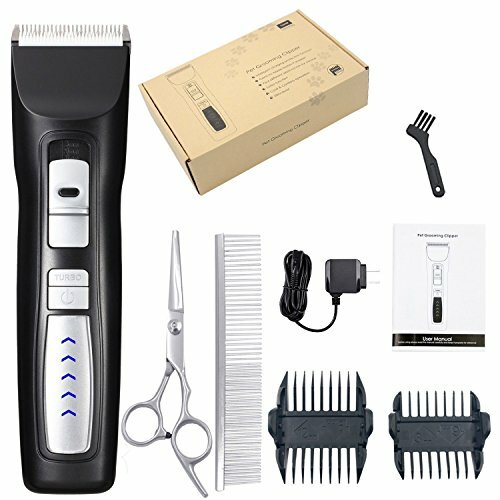 5 HOURS WORKING TIME - 2200mA Li-lion battery & rechargeable cordless clippers kit. 3 hours charge for 5 hours working time. Perfect for 2 or more pets grooming at once. Do not need to worry replacing batteries. Saves money. Cordless & Cord use design gives users more choice, which offers complete freedom to the planes and their to maneuver. SUPER QUIET AND MOTOR - Powerful, portable, precise and stable. 2-Speed control for different needs; 5500/6500 rotation per minute. Without fair of thick hair, shaving at ease. Also the design of noise reduction is more considerate for those timid pets than regular pet clippers in the market. The sound when working is less than 60 decibels. Low noise and safety blade design for dog cat & other Animals. ADJUSTABLE CERAMIC/STAINLESS STEEL BLADE - We offer adjustable blades of 1.0mm, 1.3mm, 1.6mm, 1.9mm long of tune cutting and trimming depth. With the aid of guide combs, you can decide the length of hair of your pets. The ceramic and stainless blade will not damage skin and washable easily. If you have any questions about this product by Zikke, contact us by completing and submitting the form below. If you are looking for a specif part number, please include it with your message.